Mudpie is the sweetest cat you will ever meet, but she has her grumpy days just like the rest of us do, and the #1 thing that puts her in a bad mood is the summer heat (just like her Mommy). 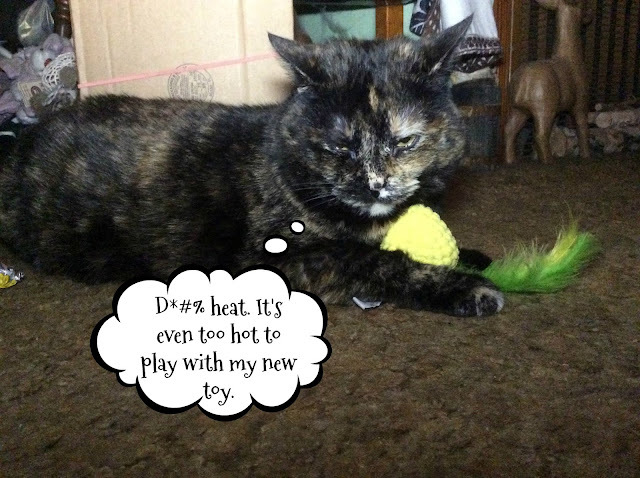 She's a chatty tortie anyways, but when she's overheated she could give Grumpy Cat a run for her money. The least little touch, even when I simply walk by her, I get griped at. We luv da heat - which is good since it's usually hot here. MOL! She has a Binga face on! We are not big fans of big heat either. Good thing it does not get as hot where we live, but we really dislike the humidity! My girls seem to be the opposite - even on really hot days, they still seek out the sun puddles! My cat bro Bert doesn't get crabby, he gets super mad and starts to shred and eat toilet paper. I know...he is odd. Paisley is pretty even-keeled and doesn't get upset about much. Except the dog. And the vacuum. And if her dinner is late. Hope your summer won't be too hot, Mudpie! I get gripey in the heat, too, Mudpie. I don't blame you one bit. Stay cool, pretty lady! It's been cooler here believe it or not...we'll try to send some of it your way, Mudpie. Aww, sorry Mudpie. I understand. Oh yes, Mudpie. 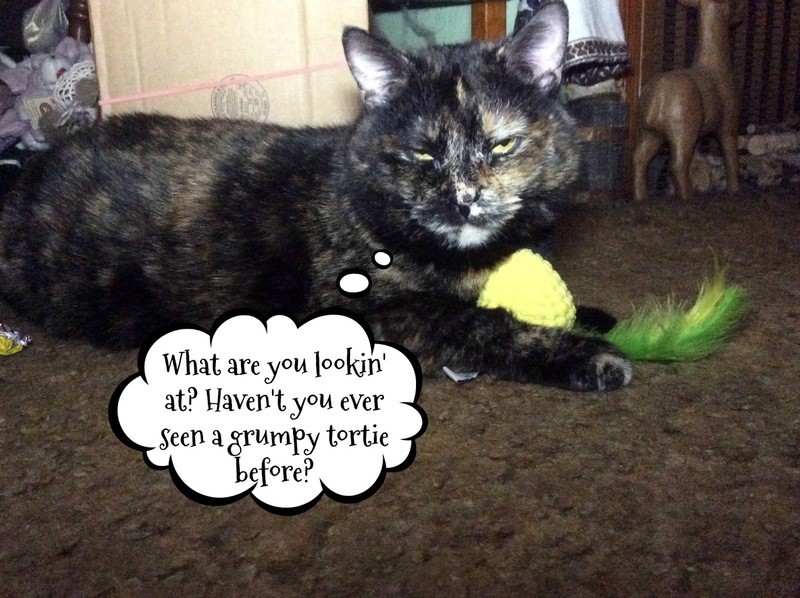 I've seen a grumpy tortie before. But my tortie loves the heat. Good thing, considering where we live! Poor Mudpie. I had a little tortie, who has since crossed over the rainbow bridge. She was a twitty tortie, and could really get in a snip when she wasn't happy. that's so funny -- Amarula gets grumpy but usually it's Frodo or Zulu's fault--the heat doesn't seem to get to her too much-of course she is from Africa! Awww...she is a cutie even when grumpy. Poor Mudpie! The summer heat can be tough to deal with. As much as I complain about the cold in the winter, the heat can be just as difficult. I can't blame you for being grumpy. Mudpie's grumpy look is adorable! Whoa! I think all the Grumpy Cat memorabilia in the house has inspired her. Hope her face doesn't freeze that way. Awww. I feel you Mudpie. Its hot here too! But I adore your grumpy face!